Tracy and I attended a TOMY event a couple weeks ago and our kids got the chance to check out a new toys-to-life game, Lightseekers. 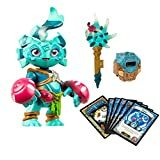 If you like Skylanders you'll love Lightseekers which offer a similar physical and digital play experience. There are many differences, so check out the Parent's Guide to Lightseekers to learn more. 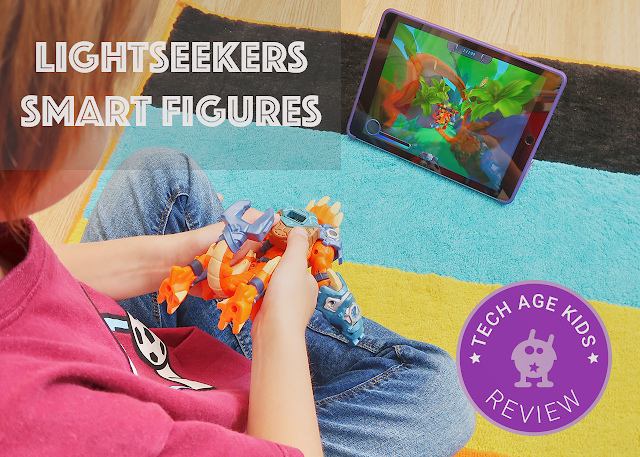 In this post, we'll explore the Smart Figures, which work with the Lightseekers mobile game, in more detail. Disclaimer: My boys won the Smart Figures at the TOMY event as one of them achieved this highest score in the coin chase party game and both helped with a promotional video. Our opinions, as always, are our own. 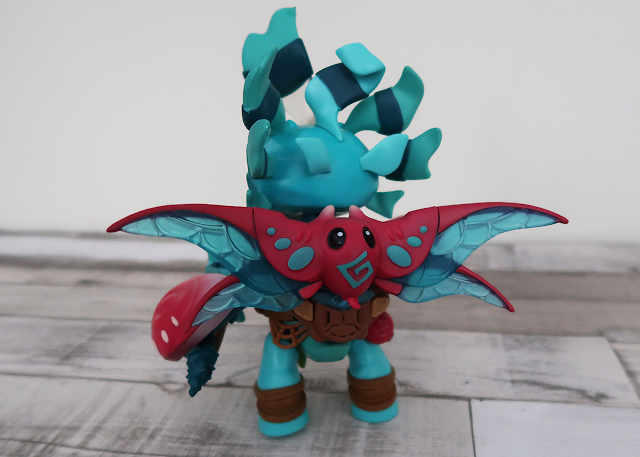 The Lightseekers Smart Figures are manufactured by TOMY and are 7" collectible and playable figures that light-up, talk and vibrate. 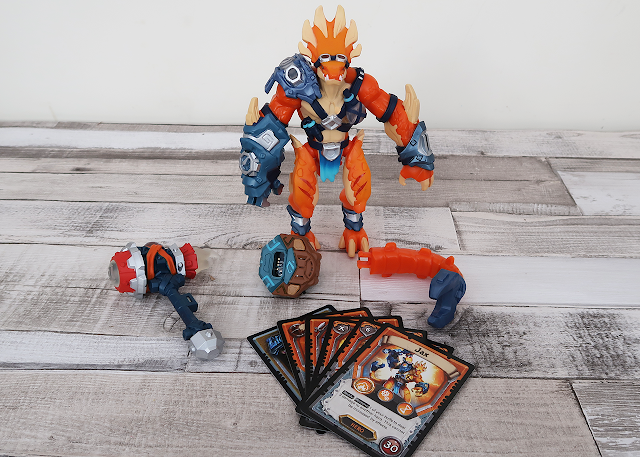 The Smart Figures come with weapons and accessories (some sold separately) to power-up in the Lightseekers game. You don't need the Smart Figures to play Lightseekers, unlike other toys-to-life products, but if your kids get hooked, this could make a very nice gift! And we think it does add value to the gameplay. The figures come with a mini computer called the Fusion Core, which stores game data and also powers the action figures. The Fusion Core is rechargeable by USB cable, which is included. The Smart Figures can be used as stand alone action figure toys, as well as linked to the mobile game and then they become game controllers for the game. I'm really impressed with the quality of the action figures. They feel really robust (even with my heavy handed 6-year-old) and the kids love the fact they have fully articulated legs and arms. "They are actual toy figures you can play with," says my 9-year-old. You can play with the figures without the Fusion Core, but when it's connected it adds lights, sounds and vibrations. The two buttons on the Fusion Core lets you play weapon-sounds (when a weapon is connected) and pre-recorded messages. When you're connected to the game, the buttons become game controller buttons. It's a pretty smart toy! I love the idea that the kids can use this toy during screen-time gaming, but when they need to have time away from the screen, they can continue to role-play the game with the figures. This is exactly how my boys have been playing with their Smart Figures. My boys are completely different and each preferred a different Lightseeker character. My youngest, who's really technical and mechanically-minded loved Jax with the Nitro Hammer. He uses his abilities and gadgets to overcome challenges. My other son, was more attracted to Kora and her connection to nature with Lightning, Water and Air powers. The figures don't necessarily shout "boy-only" and I especially like that there is also a 'female' character. There's also accessories and add-ons available for the figures which are interchangeable. The accessories clip into place really easily, but you need to use the release buttons to take them off. Be careful not to just pull the accessories or Fusion Core from the figures. 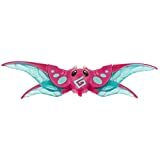 We got two flight packs, the Skyrider and Flynamo, which are sold separately. The flight packs turn your figure into a game controller. You also get one card, which you can use in the card game and activate in the mobile game. 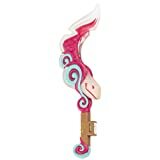 There are also two more weapons to collect - The Electro Eel and Spinblade. The weapons also come with a trading card. The weapons will store in-game stats and abilities which can be transferred to another character. The weapons have colour-changing leds which light up when you play, which is a nice touch. My son spotted this feature, as we recently did an activity using a colour-changing led. He was so pleased he knew what was happening 'under the hood'! The Fusion Core, which is the mini computer for the Smart Figures, is rechargeable using a USB cable. You can either disconnect the Fusion Core from the figure or just charge it whilst it's still attached. You'll know to charge the Fusion Core as the led light indicators will start to flash. Whilst the Fusion Core is charging the leds flash, but when it's in use they turn off. The figures connect, using Bluetooth, with the mobile game which is freely available on iOS, Andriod and Amazon devices. Your device, however, does need Bluetooth 4.0 and 1GB of RAM (device memory) to connect the figures and experience the full features of the game. Unfortunately, we couldn't get our figures to connect with our Amazon Fire tablets as the game kept crashing. They did work on my iPad Air. And it's really cool that you can connect two characters to play at the same time. My boys really enjoyed the multiplayer aspect and the 'party' games. Note: We later discovered that one of our figures has a faulty Fusion Core, which could have played a part in not getting them to connect properly. Admittedly the Smart Figures aren't cheap, but if you're going to splash money at an action figure then Lightseeker Smart Figures are definitely worth a look. Not only because they are fantastic build quality you get to use them in more ways than one. They are just cool action figures. In terms of toys-to-life games, we love that the Smart Figures are actually playable toys. Some other toys-to-life toys are stuck on bases and don't have moveable parts. I really like the interactivity the Smart Figures provide with the game. There is a connection between the physical and virtual world where movement in the real world affect your character in the game. It's a bit like playing with a Wii games console. The Smart Figures are recommended for 8+ however my 6-year-old absolutely loves his Jax and it accompanies him everywhere. 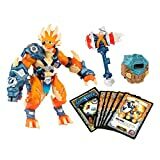 Lightseekers Trading Card Game - How does it work?